Things are already encrusting and growing pretty well. Water chemistry has been rock solid. I have no complaints about anything. Things are going pretty well so far. I have a bit of a bacteria bloom right now. This is my view from my spot on the couch. The rocks have colored up nicely. I am seeing coralline algae popping up literally everywhere. The eggcrate I put down as the protective base for my rocks is getting very purple. I tweaked the bulb combination and duration. 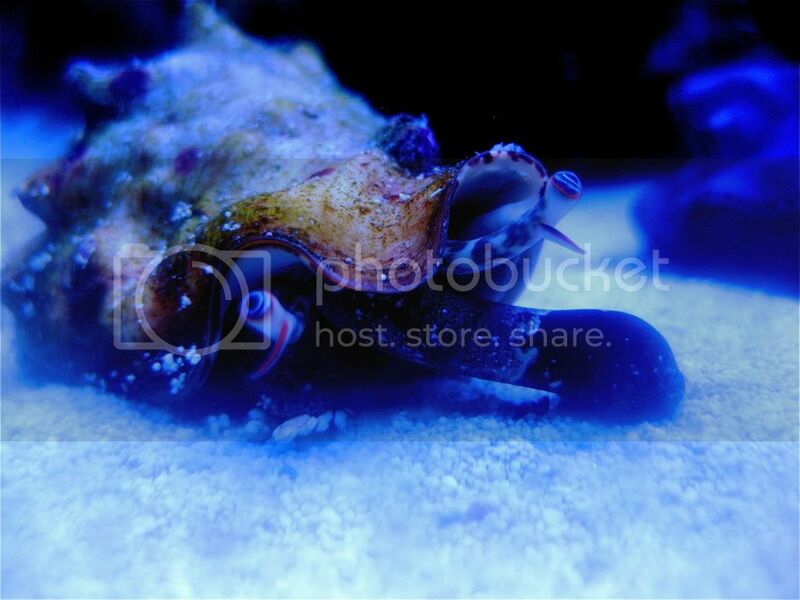 I am running four Blue Plus bulbs and two Coral Plus bulbs now. Getting great color and growth with that combination. I took the refugium offline as it was absorbing nitrates too quickly. I am nitrate dosing with potassium nitrate. Last test result was about 3ppm. My goal is 15ppm. After I hit 15ppm, I will test daily to see what the daily consumption will be. I am feeding a ton too. Lots of Reef Frenzy, Reef Chili, Pohl's Coral Vitalizer, Marine Snow and of course flakes. Mornings are flakes, evenings are Reef Frenzy and Reef Chili, nights alternate PCV and Marine Snow. All of the fish are doing great. One of my clownfish has disappeared without a trace. Not in the sump, rock work, overflows, etc. I think it jumped and a certain fuzzy four legged 11 pound hunter got to it. A single chromis has been outcast. It hangs out in my bunch of montipora digitata. At first I thought it was going to strip some tissue off the coral in preparation for laying eggs. That's not the case. It's just been rejected from the school. Thanks Jackie! Happy New Year! Cool! 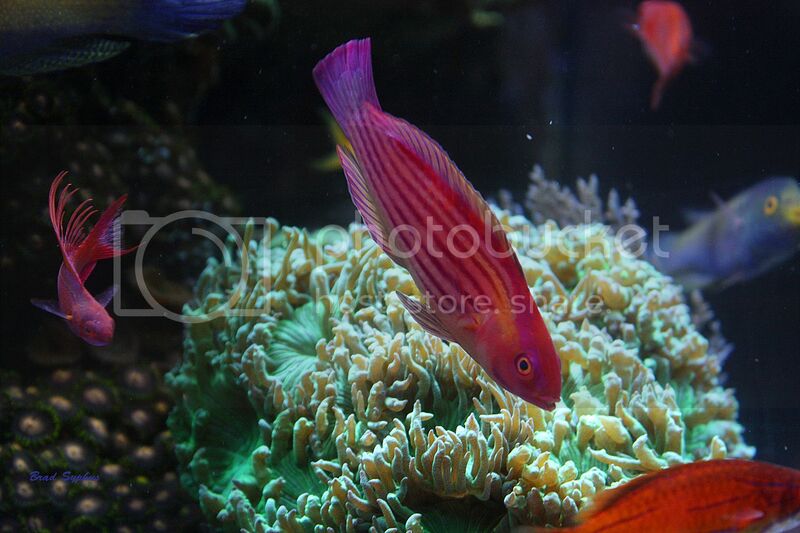 The chromis look nice in there with all the space. I thought I would make a small update. Lighting: I have decided that I need to reduce my photoperiod a bit. Lights are on from 12:00 to 19:00, full spectrum on from 13:00 to 18:00. I was seeing some corals brown and some bleach a tad. I think it was just too much light for too long, even with my high nutrients. Nutrients: Things are tough when you don't have a ton of fish in your system. :closedeyes: With such a low bioload, I am pouring in gallons of potassium nitrate. No, not really gallons, but upwards of 25ml per day erherm... Phosphorus is literally not showing up on each test result. I guess it might be time to look into phosphate dosing. Flow: To be honest, either its user error or I made a bad choice based on technical information, I don't care for the Gyre by itself. Thus why I am looking to trade it away. For whatever reason, in my system, the flow is just not great. I have tried positioning it high, low, to the left a bit, angle the cages up, down, left, right, tilted opposite, everything. I can not get a gyre to circulate in my tank well. Even with my shallow aquascape. Filtration: I am trying to keep a dirty tank. Its more difficult than I thought. I have always had issues with keeping my inevitable ULNS in the past. One of my new years goals regarding reef keeping was to keep a nutrient rich system. 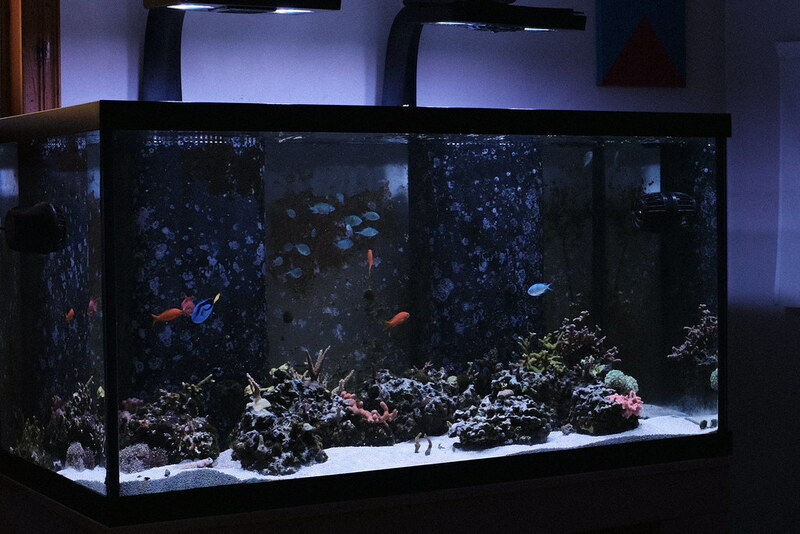 Besides dumping in buckets of potassium nitrate every day and feeding fish 3 to 4 times a day and corals once a day, I am struggling to keep nutrients high. Which brings me to my next point. Fish: What anthias should I add? I am thinking of adding 2 groups of anthias. One group of 2 females, one male of lyretail. The second group would be maybe 4 female and 1 male of bartlett's. I have thought about adding 8 to 9 more blue green chromis. But that seems kind of boring. ^^Lyretails and carberrys. I have a school of 5 in my tank and they have quickly become my favorite. Bartletts have a bad reputation and I think justifiably so. I'm leaning towards just they lyretails right now. Why do you think the bartletts have a bad reputation? i have lyretails, dispar and sunset anthias. The sunset are my favorite and i love how they keep to the top of the water column. Hopefully in the near future, i want to add a few sunburst to the mix. They all get along great! I too have a hard time with running higher nutrients in my tank. I've started thinking about dosing potassium nitrate. There's a lot of differing information on dosing to keep the tank dirty. I'd like to dirty the water by feeding more, but that's easier said than done for my situation. Bartletts can be little jerks. i have lyretails, dispar and sunset anthias.Â The sunset are my favorite and i love how they keep to the top of the water column.Â Hopefully in the near future, i want to add a few sunburst to the mix.Â They all get along great!Â I too have a hard time with running higher nutrients in my tank.Â I've started thinking about dosing potassium nitrate.Â There's a lot of differing information on dosing to keep the tank dirty.Â I'd like to dirty the water by feeding more, but that's easier said than done for my situation. I've had the sunsets and dispars on my list too. Nutrients are difficult in my reef. Potassium nitrate helps a ton. I am looking into dosing potassium chloride to elevate phosphorus. Feeding alone couldn't, and hasn't in the past, keep my nutrients at a level I want. Little jerks. I don't want jerks in my reef! Keep up with the nitrate testing when dosing potassium nitrate. I would maybe even suggest using a lab grade sodium nitrate instead, to take the need out of testing for potassium, but you're probably fine. Eventually, your tank will stop being able to consume so much and you will find a maintenance dose. Further, you will find that the maintenance dose will not be needed no longer either as you feed consistently. It can be hard to get a nutrient rich tank, as inevitably as you dose nitrate, your phosphate will drop...make sure you have a little of both :) and be careful not to over dose nitrate all in one setting as I did and my phosphate dropped so quickly it produced the same effect as running to much GFO... Regardless, of whether you have many fish or not, you can always just "feed" the tank a lot. Fish food breaks down into the same forms of nutrients eventually, regardless of whether it has been consumed by a fish or not. I know it may seem difficult throwing food in a tank with no fish to consume, so I have used liquid foods like oyster feast, etc. so my mentality doesn't suffer too much. Thanks for the response. I need to make another batch of potassium nitrate and this time I will make it more potent so I'm not putting in a ton of fresh water each dose. Instead of 2 cups or RODI water per tablespoon of potassium nitrate, I might halve the RODI. As far as potassium, that's something I am also trying to dose. But even with the amount of KNO3 I am dosing, K hasn't increased noticeably whatsoever. That is an excellent point about KNO3 driving down PO4. I've supplemented my fish foods to compensate for that already. I've been adding lots of pellet food (which none of my fish like). So there is a nutrient rich breakdown there. 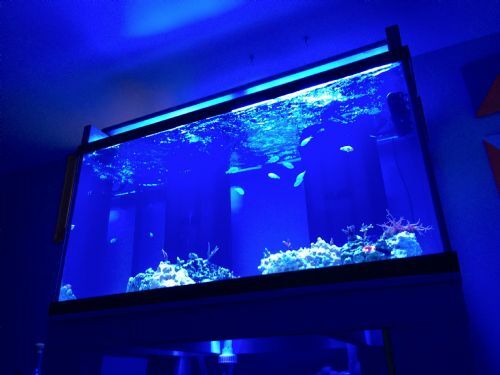 I also feed phytoplankton, Pohls Coral Vitalizer, Reef Chili, and soon Acropower at night when the lights are off. I alternate each night with a different food for the corals. Someone asked me privately what I use to test my water chemistry. I have used the Red Sea Pro kits for many years. Its very cost effective and each refill of the reagents are spot on, batch to batch. I use the Red Sea kit for alkalinity, calcium, magnesium, nitrate, potassium, iron, and iodine. I rarely test for iron or iodine. For phosphate I use a Hanna checker, which I have been happy with. do you mind sharing where you are getting your source of potassium nitrate? I know some use brightwell, flourish nitrogen, and stump remover - just curious what specific product you are having success with. I am using good ole Spectracide. I called the company 3 times and talked to 3 different people who all said it was 100% pure potassium nitrate. I was super nervous starting to dose dissolved tree stump remover in September. I guess I'm out of the loop. I spend all of my time reducing nitrates and you are adding nitrates. What have I missed?